Beginning at 2:18 p.m. Eastern time Wednesday, Americans across the country were interrupted by an urgent notification on their cellphones. Blasted out by cell towers nationwide over a 30-minute period, the message was expected to reach some 225 million people in an unprecedented federal exercise. 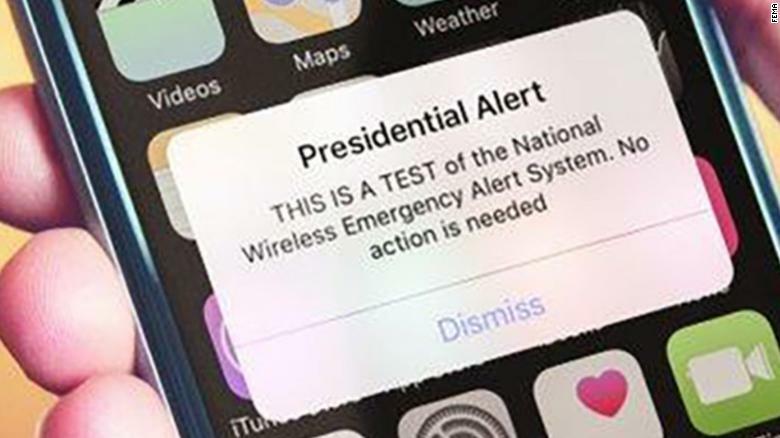 Wednesday’s test of the Wireless Emergency Alerts system is the first time that emergency management officials have used the nationwide alerting capabilities reserved for the office of the president. Reactions to the alert were swift. #PresidentialAlert became a trending topic on Twitter, where some said the message interrupted their matinee movie showings. Others reported getting the notifications pushed to their smartwatches, as still others took the opportunity to crack jokes. Some said they had received the notification repeatedly, some as often as three to nine times. A number of iPhone users on AT&T’s network — including this reporter — did not receive the notification until they had rebooted their smartphones. FEMA, AT&T and Apple didn’t immediately respond to a request for comment on the matter. The presidential alert is designed to let the White House inform the entire country almost instantly of grave public emergencies, such as a terrorist attack or an invasion, according to the Federal Emergency Management Agency. And while Americans can choose not to receive weather and AMBER alerts, they cannot opt out of presidential ones. Despite its name, the presidential alert was not issued by President Trump directly. But in general, the process calls for the president — or his representative — to authorize FEMA to send an alert on the White House’s behalf. Before a presidential alert shows up on cellphones, it must be routed to wireless carriers, such as AT&T and Verizon, through an online system called the Integrated Public Alert and Warning System, or IPAWS. The cellphone alert is also accompanied by a similar test of the Emergency Alert System, an older system that handles radio and television. The federal government is required by law to test its alerting systems every three years. FEMA last tested the EAS in 2016 and 2017, and the first wireless emergency alerts were sent in 2012. Not all cellphones may have received Wednesday’s alert, however. If you weren’t in range of a cell tower or if your phone was switched off, you probably missed the message. That was expected to be the case for only about a quarter of the nation’s cellphones. That three out of four phones probably received the warning is a reflection of our always-on, technologically connected times. Yet the same technology that has helped connect millions of people also has the potential to cause chaos at Internet speeds. In January, America’s emergency management technologies made headlines when a state-level official mistakenly sent an alert to Hawaii residents warning them of an inbound ballistic missile attack. The report was false, but it sent Hawaiians scrambling for cover, seeking shelter in gymnasiums, mountain bunkers and even in manholes. A subsequent investigation by the Federal Communications Commission found that the staffer responsible for the message had thought an attack was truly underway, having misinterpreted a drill. FEMA officials have said the Hawaii incident played no role in the scheduling of Wednesday’s test.